One of the most popular video slots at Leo Vegas is Big Bad Wolf from the provider called Quickspin. Even though the slot is an old favorite by now Leo Vegas still offers a new promotion focusing on Big Bad Wolf. The reason why is actually very interesting and exciting. Quickspin recently added a whole new feature to the slot Big Bad Wolf giving you the chance become richer while playing if you’re lucky. During the campaign at Leo Vegas you can win great prizes such as an iPhone 7, an iPad, free spins and of course cash prizes. While playing Big Bad Wof at Leo Vegas you will be able to collect special tokens in-play thanks to the newly added achievements tool. With this you can fly straight to the bonus round within the video slot. Make sure you check it out and use your tokens wisely. You can collect free spins, points to the weekly leaderboard and tickets to the final draw in two ways at Leo Vegas. For every £10 you wager on Big Bad Wolf on desktop you will receive 1 point to this weeks’ leaderboard together with one ticket to the live draw and 10 free spins. If you decide to do this on Leo Vegas mobile casino instead you will get 2 points to the leaderboard, two tickets to the draw and 10 bonus spins. 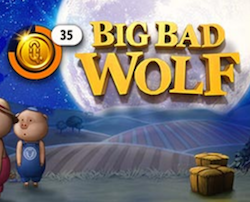 Your free spins will be available on Big Bad Wolf at Leo Vegs at 03:00 PM the following day and you can get up to 50 spins a day during the promotion. Keep in mind that wagering requirements apply on your winnings. Every week during the campaign you will be able to climb the leaderboard with your points – there are prizes worth £15 000 every week! The player who ends up with the most points will get the 1st prize with £5000 while the other top 29 players will win more cash prizes as well as iPhone 7s, iPads and iWatches. All the most popular tech gadgets from Apple in other words. The first weekly leaderboard competition will end on the 31st of May and after that there will be another three leaderboards between the 1st and 7th of June, from the 8th and 14th of June and from the 15th until 25th of June. On the 26th of June there will be a draw at Leo Vegas Celebrity Black Jack Party table at 06:00 PM. One lucky winner will get £8000 while two more players will win £5000 and £2000.